Home » Tennis » What is Arthroscopic Tennis Elbow Surgery? What is Arthroscopic Tennis Elbow Surgery? For most people who suffer from tennis elbow, tennis elbow surgery could be one of their options in freeing themselves from the insufferable pain that they are experiencing. However, tennis elbow surgery is not the only available means in order to free oneself from this condition. Most doctors take into consideration the first and simple treatments into which patients have to undergo before even suggesting a surgical process. Some of these are tennis elbow exercises, tennis elbow braces, and simply resting and applying heat and cold or ice compresses. But when pain still persists from six to twelve months of applying these basic treatments, tennis elbow surgery can becomean option. Usually, the open surgical procedure is the standard procedure for tennis elbow. Nevertheless with the new arthroscopic technique, the results are the same with open surgery but with additional advantages. Some of these advantages are smaller incisions, thus less pain after the surgery; the ability to look inside the elbow joint; only the tendon affected by tennis elbow is treated by arthroscopic method; and earlier return to sport or work without loss of grip strength. Arthroscopic tennis elbow surgery uses smaller instruments than traditional surgical instruments. 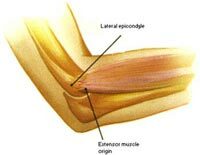 An arthroscope is inserted into the joint through a small incision on the inner side of the elbow. Another small incision is made on the outer side that is used for inserting the surgical instruments. The arthroscope is used to identify the affected tendon and to spot other problems occurring in the elbow joint. A small shaver is inserted to the affected tendon and it is divided. All other things are avoided and any loose bodies are also removed. With this process, general anesthetic is used. Because arthroscopic tennis elbow surgery is still invasive, it also involves a lot of risks that usually does not occur in the traditional way of treating tennis elbow. That is why most doctors recommend tennis elbow surgeryas a last option to treat tennis elbow.